When the athlete was asked to be a part of the campaign, it combined two of his passions; gymnastics and design. This young athlete is already one of the most successful English gymnasts but he was still surprised to be a part of the campaign for the famous designer brand which features Whitlock wearing a full suit while flexing his prowess on the pommel horse apparatus. “That was brilliant. We shot that at the beginning of 2015 and now I can’t believe how big it’s got – it’s crazy to see myself on billboards! “I like to draw a lot to be honest. One of my passions is designing, I just like designing clothes, trainers and things like that.” If ever the time comes when his ability to perform medal-winning routines ceases, the 22-year-old young athlete could still enjoy a fruitful career in the field of fashion, but asserted that it’s still far off. 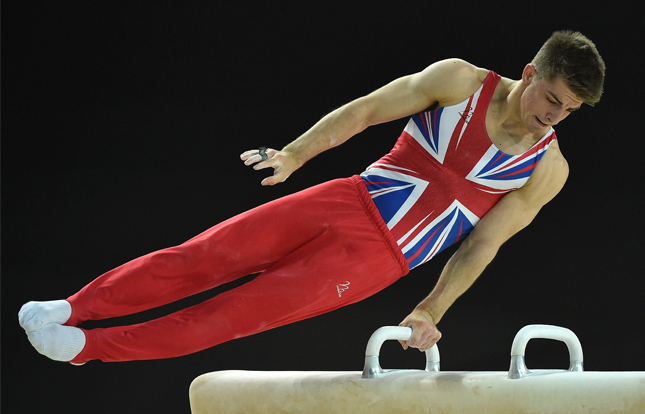 Max Whitlock along with his British Gymnastics team mates will proceed to Glasgow later this month to take part in the upcoming 2015 World Artistic Championships, and the city reminds him a lot of happy moments. This time in Scotland, Whitlock will get to compete against one of his idols — Japan’s Olympic Champion Kohei Uchimura and he acknowledges that it would be a “very hard task” to win against him. In spite of his success on the pommel horse, the floor and all around routine, the 22-year-old young gymnast is putting an emphasis on a different route this month. Whitlock became a part of the men’s senior team in the year 2011 following his fruitful junior career. He became a reserve athlete for the 2011 World Artistic Gymnastics Championships and he became a part of the bronze-medal winning team in the 2012 Summer Olympics. Having attained remarkable amount of feats in his career already, the 22-year-old English gymnast currently enjoys the success that the British Gymnastics has achieved and he anticipates that this would lead to more medals in the future. Like and follow our social media websites to receive lots of informative and recent posts related to ballet and gymnastics. Ever wondered if you have what it takes to be a successful gymnast? Enroll at Bianka Panova Sport & Art Academy to learn ballet and gymnastics for kids and we will help you to fulfill your biggest dream!